Si vous recherchez de superbes vues sur le golfe, ne cherchez pas plus loin. Greenwave vous a couvert. Cette maison confortable et spacieuse située dans le golfe de Dune Allen Beach est parfaite pour les vacances à la plage de votre famille. Avec 4 chambres et 4 salles de bains, une cuisine récemment rénovée et une grande terrasse surplombant le golfe du Mexique, vous et votre famille serez au paradis de la plage. Cette confortable maison de plage peut accueillir 11 personnes. Elle dispose de 2 lits king-size, de 2 lits queen-size, d'un ensemble de lits superposés et d'un lit de repos. Une fois que le soleil se lève et que vous avez apprécié votre tasse de café matinale sur le pont surplombant le golfe, vous serez prêt à vous rendre sur l'une des plus belles plages du monde pour vous amuser au soleil. À mesure que le soleil commence à s'estomper et que la lune prend sa place, vous découvrirez les couchers de soleil pittoresques qui ont rendu la côte du golfe célèbre. Le dîner est votre prochaine grande décision de la journée. Rassemblez-vous la famille autour du grand îlot de cuisine pour déguster des tacos au poisson faits maison, ou promenez-vous en deux minutes à pied jusqu'au campement de poissons de Stinky pour y déguster la légendaire tarte aux poissons et aux écrevisses? Ah, prendre des décisions . . .
Mieux vaut réserver cette maison populaire dès que possible. C’est l’un des favoris de longue date des Dune Allen..
Great view, but very outdated interior, and many things are run down. Arrived and immediately noticed the AC did not work. Dune Allen realty quickly sent a repair man. Had to replace major parts, took almost 4 hrs to fix and replace. The floors in living room had floor joists sticking up in many places. The linoleum floor had folds, humps and places that were wadded up like a blanket. Even our kids immediately noticed the condition of many things. Broken shelves in refrigerator, ice machine would sporatically quit working. There were pictures on the site that showed photos from 1995 that showed all the interior decor was the exact same as today. Dozens of places in the house had places where paint and sheetrock were missing or flaked away. The interior needed to be painted 10yrs ago. The deck outside had a great view but was in serious need of repair. Screws stuck out multiple places, rails were loose, front staircase on ocean side leaned and did not appear very safe. Not even sure it would pass a code inspection. It was probably great 20 yrs ago, but the disrepair was very noticeable, and a hazard for 4 children walking around and barefooted. If u rent this house be sure to bring chairs for ocean side porch. The table on front porch was falling apart. We really feel the pictures dont depict the true nature of the disrepair of this house. It was probably a great location 25 yrs ago, but not much has been done to take care of it since then. We love santa rosa beach, come here at least 2x a year. Especially Dune Allen area. Just feel especially for the price, Greenwave needs some serious TLC. On a positive note, Dune Allen Realty was quick to assist us in fixing the AC. They were very friendly and helpful. Without some exterior and interior work, I would not reccommend this house. There are many on Dune Allen Beach that were in alot better shape. Thank you for your review and your complaints are well noted. This old-Florida style house is all about its amazing location and gulf front views! We are very sorry to hear that your stay was anything less than perfect. Unfortunately, the AC was not working properly when you arrived and we immediately sent an AC technician to repair it the same day. We apologize for any inconvenience this may have caused. I assure you the home has been recently updated with new flooring in the kitchen and living area, new living room furniture, 2 remodeled bathrooms as well as other updates. Greenwave is a very popular house - stays booked, and at leasts half of its guests return to it every year. It is indeed an older home, but I assure you, it is well-cared for. After this busy season, the owner is making more updates, but of course the home will remain an old-Florida beach house - believe it or not, many guests requests old-Florida beach houses. Again, we are very sorry for your dissatisfaction, and hope that you will give us another try in the future. Greenwave is perfect. Right on the sand. It’s truly relaxing! The perfect place to go with family. The white sand during the day and the stars at night. Away from the Destin and Seaside traffic but close enough to go to both if you want. Lots of cool places to go for fun like Elmo’s and Stinky’s. You can also stay in. Great kitchen. Lots of cookware and an ice maker!! I’ve been going to this area for 40 years. This is my favorite house so far for being on the beach with that original feel of the area. Thank you so much for your wonderful review! We are so happy to hear that you had a great time at this lovely gulf front home! We hope to welcome you back again soon! Overall we had a great stay. The house(camp) is older. The kitchen and two bathrooms have been updated. The location is perfect! 50 steps to the water from the house. The building is raised on stilts and does shake/sway when people walk. My mom gets motion sick easily and had to take Dramamine. The wooden steps are in need of repair. Nails sticking up and unstable. Great parking. No elevators or crowds to deal with is a positive! Thank you for your review. We are glad that you had a good stay and enjoyed the fabulous gulf front location and the updated kitchen and bathrooms! I assure you the house does not sway, but maybe being that close to the water and hearing the ocean it might make you feel like you are on the water. Thank you for reporting the exposed nails on the deck. We will have one of our Maintenance Technicians go over immediately to secure them. If someone had reported this during your stay, we would have remedied the situation at that time. Thank you again, and we hope to welcome you back again in the near future! The house was everything we wanted for our family trip! Being able to be just steps from the beach was our priority and having a full bath w/ each bedroom. The house was very clean and updated as well as comfortable beds. The only thing that would have been nice to have was some cleaning products. I suggest future renters, if possible, bring some from home and basic spices. Most house I have rented in the past, had cleaning products either from the owner or from previous renters. Not that big of a deal, but just convenient. All in all it was a fantastic trip and will definitely rent the house again!! Thank you for your review! We are so happy to hear that you and your family enjoyed this lovely gulf front home! We hope to welcome you back again soon! This property had everything we could wish for. There were three couples sharing the house for a week and each of us gives Greenwave a five star rating. The view is ideal.. magical really.....right on the Gulf and quite private because of the location on Santa Rosa Beach AND particularly on Ft Panic Lane instead of 30A. The beds were very comfortable, the furniture just right for us, except for perhaps more deck chairs( which would add so much to the comfort for a group like ours). The kitchen is well-stocked and had pans and dishes and tools for our every desire. Thank you for your wonderful review! We are so happy that you enjoyed this gulf front home! We will share your feedback with the owner about adding more chairs to the deck. We hope to welcome you back again soon! Thank you for your review. 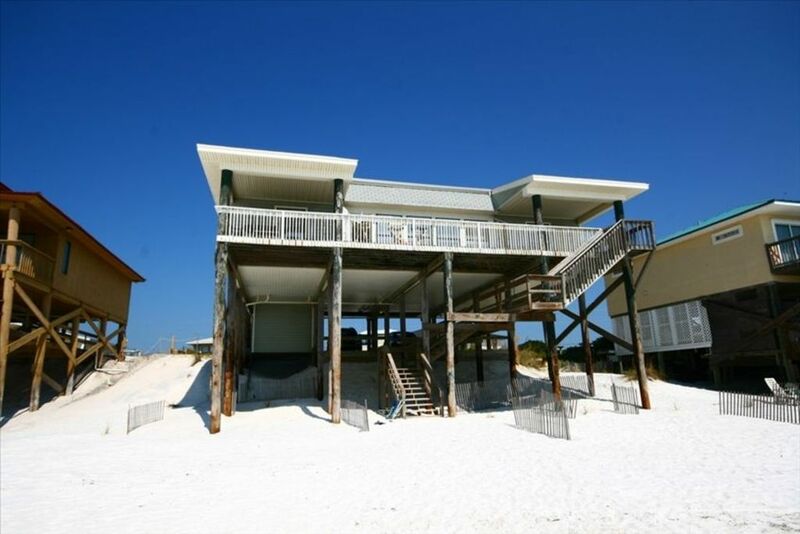 We are so happy that you and your family enjoyed this lovely beach front home! We are sorry to hear that your beach items left on the beach at night were picked up by the beach code enforcement. They do enforce the "Leave No Trace" ordinance on our beaches in South Walton. We provide the information in our rental packets, and we apologize for any inconvenience this may have caused during your stay. Despite the above, we hope to have you and your family back again soon! Dune Allen Realty, Inc. fournit des VRBO avec adresse exacte, mais Dune Allen Realty, Inc. ne peut être tenu responsable de toute inexactitude Google Map.